Chrichton's World: Review Hatchet (2006): Hilarious, suspenseful and incredibly bloody and gory. I love it! Review Hatchet (2006): Hilarious, suspenseful and incredibly bloody and gory. I love it! Hatchet might not be entirely original but it does deliver on the horror goodness. Next to that I found myself laughing at the high amount of jokes this film throws at you. And Victor Crowley definitely is a monster who can measure himself with Jason, Freddy and Michael Myers. It's a long time ago that I have seen this originally but I remember loving it very much. Now after my second viewing I feel the same. In my opinion this is very close to being a classic. But perhaps we need to give a few years more to make sure. In any case Hatchet moves in an incredibly fast pace with just enough attention to the main characters and the monster. Main characters Marcus (Deon Richmond who played Kenny in The Cosby Show) and Ben (Joel David Moore) go out on a night tour and naturally things go horribly wrong. Marcus didn't even want to go but because he is good friend to Ben he joins him. This makes you root for him since he is a good guy. Shawn (Parry Shen) is the tour operator who turns out to have bamboozled his passengers just to earn a quick buck. Despite his dishonesty he is a likeable guy. The same can be said of the other characters since they all have their flaws and good characteristics that make you want to see them get hurt. Of course this is inevitable since they are in Victor Crowley's territory. Crowley is basically a Jason Voorhees clone without the mask and perhaps a whole lot stronger than Jason since he is able to tear people apart like it's nothing. You get to see this tearing in all it's glory and it's beautiful. Writer / director Adam Green does go over the top with the blood and gore however he never neglects to build up suspense and tension so that it never gets tedious or boring. Combined with the humour you will be entertained throughout. However since the emphasis is on the blood and gore it's not a story that has twists or turns story wise. 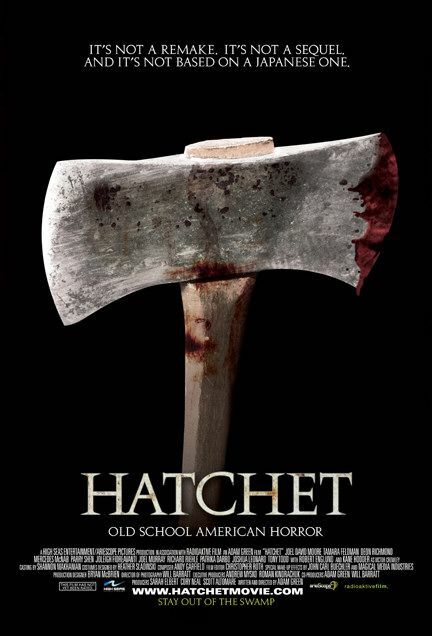 Hatchet is a throwback to old school horror in the same vein as the Friday the 13th franchise. If you don't like those movies it is very probable you won't like this either. However if you do, you are in for a real treat.